* Valid Friday, December 10, 2010 only. Offer expires on 12/10/10 (11:59 EST). Code SP6 valid only on Zoya.com only. Continental US only. Consumer orders only. Limit six free Zoya Color Spoons. Limit one per customer. Standard S/H applies for all additional non-spoon items. 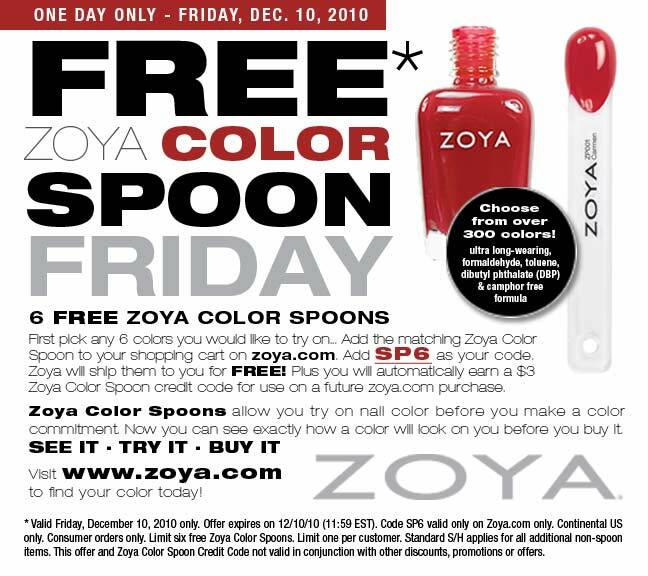 This offer and Zoya Color Spoon Credit Code not valid in conjunction with other discounts, promotions or offers. It's a shame that's only for US. =( I wanted to see some colors before spending my money on nail polish next year!